We think dive watches are some of the coolest looking timepieces out there, and they should be a staple of anyone's collection. Okay, we know strapping on a watch capable of surviving a plunge to over 1,000 metres and boasting a helium escape valve might seem unnecessary to 99-percent of us, but then you wouldn’t tell a Ferrari owner that their pride and joy’s top speed was meaningless, would you? Diving watches began life to serve a clear purpose - they provided accurate, illuminated time and a means of measuring depth with a rotating bezel, while being tough enough to handle the pressure of being submerged to great depths. They also feature straps which open extra wide to fit around the outside of your wetsuit, and often have themed names like Seamaster, Aquadive and Sea Dweller. If you would allow us to get technical for a moment, the International Organisation for Standardisation (ISO) offers a whole list of features required for a dive watch to truly be called a diving watch. These include a unidirectional bezel marked at least every five minutes, the presence of an indication that the watch is running while in total darkness (like an illuminated second hand), magnetic, shock and chemical resistance, and the ability to be read from 25cm away in total darkness. But now the diver's watch is as much a piece of precision underwater equipment as it is a fashion statement. Whether you are diving into the sea or an overflowing inbox, here are our favourite dive watches at any budget. With a name like Seamaster, you’d expect good things from this watch - and you won’t be disappointed. Tracing its origins back to 1957, Omega designed the Seamaster range especially for divers and professionals who work underwater. As such, there is 300 metres of water resistance, a screw-in crown, unidirectional bezel, illumination on all elements, resistance to magnetic fields and a tough, lightweight titanium case with matching strap. The co-axial name refers to an automatic movement which winds in both directions as your wrist moves. Power reserve is a healthy 60 hours. Waterproof to a full 3,900 metres (12,800 feet), the Rolex Deepsea is entirely worthy of its name. The 44mm wide steel watch has a helium escape valve, which lets gas out when a diver goes through decompression after a deep dive. This specific watch’s D-Blue Dial gradually shifts from blue to black and commemorates James Cameron’s solo dive to the deepest place on earth, the Mariana Trench. Power reserve is approximately 44 hours. The Tudor Black Bay might be the perfect starting point if you're looking for your first 'proper' watch. It's premium but not too expensive, it's got history, and it shares technology with its parent company Rolex. Of course, it's also a very attractive, wearable, everyday watch as well. The Black Bay is available in a range of colourways, including the steel case with black face and bezel (pictured above). If you're looking for something which stands out a bit more, the brand also offers the steel case with a red bezel, blue bezel, or a striking bronze model. As a true diver's watch the Certina DS Action Diver Powermatic 80 fulfils all the requirements of the ISO 6425 standard. It's waterproof up to 300 m and has a massive power reserve of up to 80 hours. That's a very desirable package considering the watch costs under £700. The HydroConquest’s classic good looks make it one of the most attractive watches in this list, and with a 39mm wide case it isn’t as intimidating as most diving watches, which tend to be on the bulky side. The watch is water resistant to 300 metres, and has a self-winding mechanism with a 64-hour power reserve. Looking for a retro dive watch which is certain to stand out from the crowd? Try the Rado Captain Cook MKII on for size. The classic tonneau (barrel) shaped case is a conversation starter, and the inner rotating bezel means this piece is as functional as it is handsome. Rado has worked hard to evoke the original Captain Cook model, and we think they've done a great job. Measuring in at 37mm, it's not too large, either, which is ideal for those who prefer vintage proportions, as well as vintage designs. Ulysse Nardin's new 42mm “three-hand” Diver is the house's new entry-level tool watch. The concave bezel and domed sapphire glass work together with with an uncluttered dial, touches of retro beige, and a gold central second to give this piece a truly vintage feel. The inspiration comes from the house’s 1964 dive watch, the “Diver Le Locle”. The GPS coordinates of Le Locle, the Manufacture’s hometown since 1846, adorn the dial. A classically designed diving watch, this automatic Seiko has a stainless steel case with black polyurethane strap. The case measures 41mm across and there are all of the usual diving hallmarks - a unidirectional rotating bezel, illuminated hands and hour markers, and water resistance to 200 metres. When the Fifty Fathoms was originally released in 1953, it was one of the very first dive watches. Yep, even beating the Rolex Submariner and Omega Seamaster. It became famous due to its record breaking 200m water resistance. Oh, and it was beautiful as well. 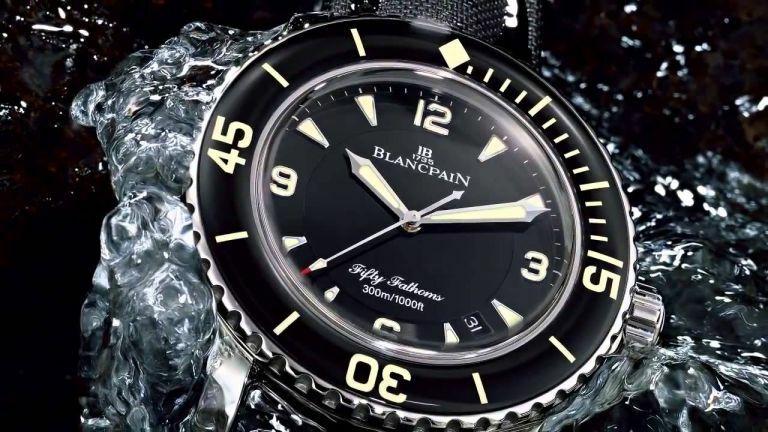 Blancpain's modern Fifty Fathoms collection embodies the brand's passion for the underwater world, being just as beautiful and just as iconic as the original. Yes, we know this watch doesn’t have the unidirectional rotating bezel of the others, but we’re going to make an exception on account of the Royal Oak Offshore Diver looking like it’s built like a nuclear submarine. Available in a wide range of colours and finishes, the Diver has a 42mm wide case, an automatic movement with an impressive 60 hours of power reserve, and it is water resistant to 300 metres. This 44mm diving watch aims to be as legible as possible, thanks to its bold face, anti-reflective sapphire crystal, large illuminated hands and hour markers - and of course the diver’s friend, a unidirectional 60mm diving bezel, which is available in four colours. A screw-down crown and case back ensure the watch is waterproof to 300 metres and the leather strap has been treated to be water resistant. A glass rear means you can admire the automatic movement when back on dry land. Available in no fewer than five different colour options - including white, blue and orange - the Combat Sub Aquarius by Glycine features a large 46mm bezel, is water resistant to 50 atmospheres (500 metres), and has an automatic movement with a 38-hour power reserve. The strap has an integrated diving extension for fitting neatly over your wetsuit, and there is a helium escape valve at eight o’clock - although many will argue this is more a gimmick to show off with at the pub than an essential feature. Still, when you can have one, why not? Bell & Ross are better known for watches inspired by aircraft instruments, but with this one it instead dips its toe into the waters of the diving watch market. The RB03-92 Diver features the company’s iconic square design, but with a rotating diver’s bezel on top. Inside sits an automatic movement that is resistant to magnetism and has a 38-hour power reserve. Water resistance is listed as 300 metres and all elements of the hands and watchface are illuminated, just as the ISO requires them to be for a proper diving watch. The Diver’s strap is made from black woven rubber and what B&R calls ‘ultra-resilient synthetic fibre’. And now for something rather different...the Aquapod by MB&F is probably unlike any wristwatch you have ever seen - and certainly unlike any diving watch. For a start, it is enormous. The watch is 53.8mm across and sits 21.3mm tall, practically standing proud of your wrist for passers-by to admire its horological beauty. Instead of the unidirectional bezel sitting on the face, it loops around like Saturn’s rings and draws your attention to the unique face and automatic movement within. With a design inspired by jellyfish, the Aquapod is limited to just 99 pieces worldwide, of which 33 will be grade five titanium and 66 will be rose gold - the latter costing in the region of £100,000. Now available for under £135, this Hugo Boss diving watch has a rotating dial and illuminated hands and hour markers. It is water resistant to 100 metres and at 46mm is one of the largest watches showcased in this feature. The watch is big, simple and features a date complication at the six o’clock position. The clue’s in the name, but the turquoise details on this Aquadive Bathysphere give it a punchy and unique look. It might make the watch stand out a little too much with formal wear - and in such occasion you’ll want to lose the rubber strap - but as a diving watch with a bit of 1970’s character it’s hard to beat. The watch features an automatic movement and is waterproof to 1,000 metres. In case you’re wondering, the turquoise hand and dial give a 24-hour reading of the current time. If you thought diving watches were four figures and more, then prepare for a pleasant surprise. This 40mm Casio is a little over £100, yet rocks the classic diving watch looks, complete with rotating numbered bezel, illuminated second hand, and a durable rubber strap. Even more amazing is this budget entry’s 200 metres of water resistance.